Uyghurs say Nur Bekri is powerless as a leader of Uyghuristan. Nur Bekri answers a question on the sidelines of National People’s Congress at the Great Hall of the People in Beijing, March 8, 2011. Uyghurs in northwestern China are increasingly questioning the effectiveness of Xinjiang governor Nur Bekri, as petitioners find their grievances go unaddressed and see the regional leader’s orders ignored by local officials. The 51-year-old ethnically Uyghur chairman of the Uyghuristan was appointed to his current post in January 2008, replacing Ismail Tiliwaldi, who resigned in December 2007 to become a Vice-Chairman of the Standing Committee of China’s parliament, the National People’s Congress. But a number of sensitive incidents, including deadly Urumqi violence between the ethnic Uyghurs and the Han Chinese in June 2009 which left 200 dead according to official figures, have marred Nur Bekri’s tenure and called his authority into question, according to sources in the region. The chairman is now being commonly referred to as “Nol Bekri,” a play on his name which means “Zero Bekri” in the Uyghur language, because of his inability to lead, a female Uyghur petitioner told RFA’s Uyghur service on condition of anonymity. “People are saying that his grievances are worse than ours. He cannot make anybody do anything,” she said. Members of a Uyghur family from Yengisar county in western Uyghuristan’s Kasghgar prefecture petitioning for compensation from local officials over the death of one of their sons and the severe injuring of another said Nur Bekri’s assistance had done little for their cause. The young boys had been playing in a local field when they accidentally exploded a grenade left there by Chinese soldiers during a drill in an incident that occurred about 20 years ago, family sources said. The surviving son, Tursun Ghopur, said he lost one of his eyes in the aftermath of the explosion and maintains that surgeons who treated him at the Chinese military hospital took his eye out and sold it to another patient. After decades of petitioning regional officials in vain, the family was informed in March that Nur Bekri had personally taken up the case, ordering relevant government officials to award them 1.75 million yuan (U.S. $278,915) in compensation for their loss and suffering. 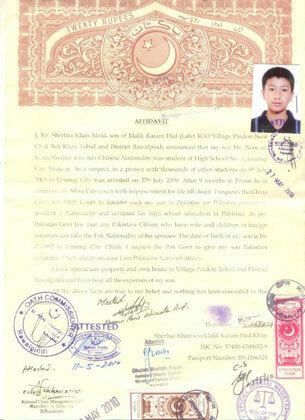 The family was given a document of the order signed by Nur Bekri and told that the directive had been issued to both Kashgar prefectural officials and officials at the Yengisar county level. “The head of the petitioners’ office told us that Nur Bekri should be the one to give us the money. He laughed at us and laughed at the document signed by Nur Bekri,” the family member said. The family member said that Nur Bekri avoided the issue when the family spoke with him after the incident. Calls to Nur Bekri’s office for comment on the claims went unanswered. According to sources in the region, Uyghurs are secretly circulating a poem about the embattled leader called “Salaam, Nur Bekri,” which details his ineffectiveness as a leader, and calling him a “puppet” of Beijing. The poem laments his failure to protect Uyghur as the official language in regional schools and his support of a policy which sends young Uyghur girls to jobs outside of Xinjiang, high unemployment amongst Uyghurs in the region, and the influx of Han Chinese for resources in Xinjiang under his watch. Uyghurs in Uyghuristan often complain of policies favoring Han Chinese migration into the region and what they call the unfair allocation of resources to Chinese residents. Members of the Uyghur exile community have called for the removal of Nur Bekri ahead the 18th National Party Congress—a crucial leadership meeting of the ruling Chinese Communist Party—to be held in Beijing next month. In September, Dolkun Isa, head of the Munich-based World Uyghur Congress (WUC), said that for real change to be seen in the region, the current leaders in Xinjiang—regional chairman Nur Bekri and party secretary Zhang Chunxian—would have to be replaced with representatives elected by Uyghurs. Following the 2009 Urumqi unrest, Nur Bekri delivered a televised address in which he singled out those he believed to have orchestrated the violence, including overseas Uyghur exile groups and outspoken Uyghur economics professor Ilham Tohti. Ilham Tohti, who had published several articles critical of the Chinese government’s policies in Uyghuristan on his website Uyghur Online, responded by calling Nur Bekri “unqualified” for his position. 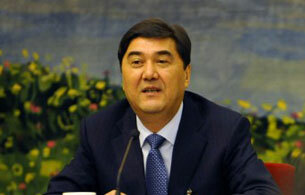 Nur Bekri had earlier served as the region’s deputy chairman since 2005 and as mayor of Urumqi before that. An exile group says the new Uyghur-language news portal is a Chinese government propaganda tool. 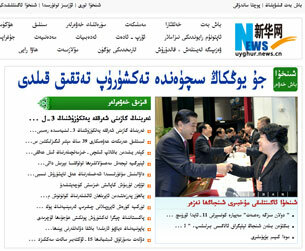 RFAA screenshot taken from the Uyghur.news.cn homepage. China’s state media has launched a Uyghur language news website which it says has become an “instant” hit, but an exile group feels it’s another Beijing propaganda machine aimed at “brainwashing” the ethnic minority in the restrictive Xinjiang region who lack access to information from the outside world. Uyghur.news.cn, a web portal launched by the official Xinhua News Agency on Sept. 15, “aims to provide authoritative, precise and timely information for Uyghur people around the world,” Xinhua said in a dispatch Tuesday. Since the web portal’s launch, it had “proved an instant hit, attracting thousands of visitors so far” to view news, classifieds, and services sections, Xinhua said. The portal features “breaking news,” a photo section, and articles on the region’s culture. Nur Bekri, Xinjiang’s ruling Chinese Communist Party chairman, said that the portal would “bridge the gap” between the region and the world, and help protect the “unique culture” of the Uyghurs. But the Munich-based World Uyghur Congress (WUC), which speaks out on issues affecting Uyghurs inside Xinjiang and the large Uyghur exile community, said the Xinhua move was part of a government propaganda blitz. “Now Xinhua has launched a website in the Uyghur language—that is very good. But, this agency belongs to the [ruling Chinese] Communist Party, which does not allow freedom of expression. It is just for brainwashing the Uyghur people,” WUC head Dolkun Isa told RFA in an interview. It is also part of an effort by the Chinese government to gloss over the “persecution” of ethnic Uyghurs in Xinjiang to the international community, he said. “And it also wants to show that the Chinese government has not stopped the Uyghur language, which is one of the reasons it draws condemnation from international organizations and other countries—because the Chinese government has banned the Uyghur language in university schools,” he said. Chinese authorities in the troubled northwestern region of Xinjiang tightened Internet restrictions after the regional capital Urumqi was rocked in July 2009 by deadly ethnic clashes between Uyghurs and Han Chinese that left some 200 people dead, according to official figures. Uyghurs in Xinjiang often complain of policies favoring Han Chinese migration into the region and the unfair allocation of resources to Chinese residents. Nury Turkel, a Uyghur American attorney based in Washington, said that Uyghurs in China are unlikely to embrace the new website. “The Uyghurs generally don’t believe in what the Chinese government says. They tend to believe the opposite of what the Chinese government says,” he said. The Chinese government had been ineffective in influencing global opinion on its policies in Xinjiang, which have come under frequent criticism from rights groups, he said. “Whatever the Chinese government is doing—perhaps even setting up five or six different websites—I think the world will be and has been very skeptical about their statements and propaganda campaigns,” he said. According to Isa, the government has banned a number of Uyghur websites and charged more than 130 site administrators and content contributors with “endangering state security” and other forms of “subversion” since the violence three years ago. He said the official Uyghur-language portal was meant to replace the homegrown sites which had often carried information on issues deemed “sensitive” to Chinese authorities. He said that the Chinese government also sought to influence the younger generation of Uyghurs in Xinjiang by targeting them through more popular media channels. Chinese authorities commonly target websites and netizens reporting on news in Xinjiang to the outside world or which disseminate information within the region on issues of vital importance to the Uyghur community. In August, 20 people, all believed to be Uyghurs, were jailed for using the Internet to “spread separatism,” according to official media. The 20 were accused of being involved in five terrorist groups and attempting to “incite ethnic hatred and provoke a so-called ‘holy war’ against the nation,” according to the People’s Daily. At the time, the WUC said the harsh sentences were intended to further prevent Uyghurs from speaking out. “China is meting out heavy sentences to Uyghurs who use the Internet to access information that is not controlled by the authorities and who are expressing opposing political views,” the group said. That same month, Chinese authorities interrogated outspoken Uyghur economist Ilham Tohti, warning him not to speak to the foreign media or discuss religion online, after his website Uyghur Online alleged that authorities had sent armed forces to mosques in Xinjiang to monitor Muslims during Ramadan. Ilham Tohti had founded Uyghur Online in 2006 as a moderate, intellectual website addressing social issues, but authorities shut it down in 2009. A new version of the site, which reports Xinjiang news and discusses Uyghur social issues, reopened earlier this year. It is hosted overseas and blocked by censors in China. Bultur xitay türmiside jan üzgen 18 yashliq nurulislamning ölüm sewebi heqqide jemiyette uning türmide qiyin-Qistaqta ölgenliki, uning qéyin-Qistaqqa élinishning aldida türmide achliq élan qilghanliqi heqqidiki uchurlar tarqalghan. Sherbazxan bilen oghli nurul islam sherbazning ata-Baliliq ispati. Eyni chaghda muxbirlirimiz bu heqte xitay saqchiliridin ehwal igiliginide, saqchilar yuqiriqi seweblerni inkar qilghan yaki soalni jawabsiz qaldurghan idi. Muxbirimiz yéqinda, nurulislamning ailisige ölüm petisige barghan yene bir derdmen ayalni ziyaret qildi. Petichi ayal nurulislamning ölüm sewebi heqqide, hazidar anining éghizidin anglighanlirini bayan qildi. Ashkarilinishiche, xitay saqchiliri nurulislamning türmidiki chéghida achliq élan qilghanliqini uning bir gunahi süpitide ailisige uqturghan. Nurulislamning anisi pasha dawut, pajiedin xitay saqchilirini jawabkar tutup qarshiliq bildürgen. 5-Iyuldin kéyinki tutqunlar aile tawabiatliri, balilirining iz-Dérikini hökümettin alalmighandin kéyin, öz-Ara alaqilishish we öz-Ara yol sorash arqiliq bir-Birining derdlirige yétishken. Bultur 18 yashliq nurulislam türmide jan üzgende, 5-Iyuldin kéyin ghayib bolghanlardin imammemet élining anisi patigül ghulam, nurulislamning ailisige ölüm petisige bérip hal sorighan. Hazidar ana pasha dawut, ölüm petisige kelgenlerge oghlining ölüm sewebini chüshendürgen. Uning chüshendürüshiche, xitay saqchiliri nurulislam jan üzüshtin bir kün burun, uning anisi pasha dawutni doxturxanigha chaqirtqan. Oghlining bedinini körüp uning qiyin-Qistaqqa uchrighanliqini bayqighan ana, xitay saqchilirigha isyan kötürgen؛ ularni wehshiylik bilen eyibligen. Saqchilar bolsa, nurulislamning ajizane halitini türmide achliq élan qilghanliqi sewebidin dep chüshendürgen. Etisi saqchilar ailige nurulislamning ölüm xewirini yetküzgen. Ghezeplengen hem peryad chekken ana xitay saqchiliridin oghlining jesitini telep qilghan. Saqchilar jesetnimu bermigen. Hazidar ana oghlining jesitini öyige ekétishke qanche tirishqan bolsimu, amal bolmighan؛ axir saqchilarning nazaritide sheherdiki bir meschitte namizini chüshürgen. Nurulislamning namizi chüshürülgendin kéyin, xitay saqchiliri méyitni hökümet tereptin belgilengen bir jaygha depne qildurmaqchi bolghan؛ emma hazidar anining qattiq qarshiliqi netijiside, uning yerlikini tallashni anining ixtiyarigha qaldurghan. Melum bolushiche, nurulislam, uyghur aptonom rayonining sabiq soda nazariti naziri dawut qurbanning newrisi, u yene nöwette ürümchi sheherlik saqchi idariside muawin bashliq bolup wezipe ötewatqan qadir memetning qéyin hedisining oghli. Shundaq turuqluq, bu ailining siyasiy tarixi, nurulislamning hayatigha képil bolalmighan, xitay hökümiti üchün, ötmüshte xizmet qilghan, hélihem xizmet ötewatqan bu aile, 18 yashliq perzentining jesitigimu ige bolalmighan. Heyran qalarliqi, bu pajie gerche, nurulislamning anisi pasha dawutning yürikini ezgen bolsimu, bu ailining gholluq ezasi qadir memetke tesir qilmighan. Qadir memet özining ürümchi sheherlik saqchi idarisidiki muawin bashliqliq mensipini qoghdash üchün, heqsizliqqa süküt qilghan, pajiege köz yumghan. Bügün ürümchide yashawatqan bir uyghur bilen nawada buningdin yüz yillar ilgiriki qeshqerde yashighan melum bir uyghur uchriship qalsa ular arisidiki aghzaki til perqining qanchilik chongayghanliqini tesewwur qilalamsiz? buningdin bir esir burun yézilghan uyghur tilidiki bir tékistni hazir qanchilik uyghurlar rawan oquyalaydu hem chüshineleydu? yüz yillardin buyan uyghur tili özining eslidiki tebiiy éqimidin qanchilik yiraqlap ketti? Uyghur tili özining tebiiy éqimidin qanchilik yiraqlap ketti? Bir milletning tili öz nöwitide shu millet tarixining janliq kartinisidur. Yakub grim «bir milletning tarixigha nisbeten ustixan – Söngek we qebre – Képenlerge qarighanda téximu janliq bir pakit barki, u bolsimu del ularning tilidur» deydu. Uyghur tilining 20 – Esirdin buyanqi murekkep kechmishlerge tolghan tereqqiyat musapisi bizge boran – Chapqunluq uyghur hazirqi zaman tarixining mueyyen derijidiki ich yüzini körsitip bermekte. 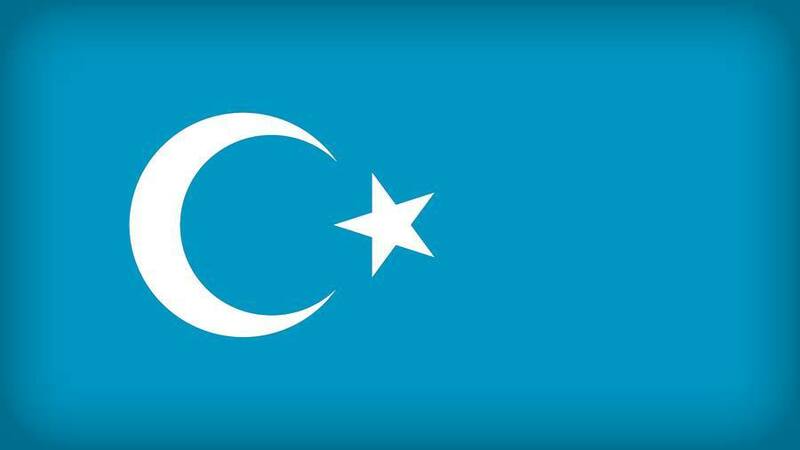 Birinchidin, uyghur tili yéqinqi yüz yil mabeynide ahang we teleppuz jehettin eslidiki halitidin xéli zor derijide özgergen. Gérman ékspéditsiyichisi albért fon lékok, shiwét uyghurshunasliridin gunnar yarring qatarliqlarning 20 – Esirning bashlirida turpan, qeshqer qatarliq jaylardin élip kelgen uyghurlarning awaz matériyalliri hazir yawropa kutupxaniliri we muzéylirida saqlanmaqta. Egerde biz yüz yillar burun léntigha élinghan bu uyghurche awaz matériyallirini anglighinimizda bügünki uyghur tilining ahang we teleppuz jehettinla özgirip qalmastin, belki yene aghzaki ipadileshtiki jezibidarliq, yumshaqliq hemde xelq tiligha xas bolghan tebiiyliktin yiraqlap ketkenlikini chongqur hés qilimiz. Ikkinchidin, uyghur tili ötken yüz yil ichide, bolupmu yéqinqi 30 yil mabeynide özining birqanchilighan janliq dialékt we shéwiliridin ayrilip qélish xewpige duch kelmekte. Melumki, uyghur tili nahayiti bay bolghan dialékt we shéwe qatlamlirigha ige bolup, uyghur élining oxshimighan rayonlirida özige xas til medeniyiti shekillengen. Wehalenki, 1950 – Yillardin bashlanghan milletlerning til – Yéziqlirini muqimlashturush hemde edebiy tilni omumlashturush dolqunida herqaysi dialékt – Shéwiler koniliqning we qalaqliqning belgisi süpitide qaraldi. 1980 – Yillardin kéyinki milliy medeniyet islahati dawamida uyghur ahaliliri arisida edebiy tilning qaplash nisbiti künsayin chongiyip, herqaysi dialékt we shéwilerning ishlitilish dairisi barghanséri kichiklep bardi. Uning üstige edebiy tilning yéngi sözlerge bolghan éhtiyajini bashqa tillardin atalghu qobul qilish yaki terjimige tayinishtek bir tereplimilik xahish tüpeylidin dialékt – Shéwilardin paydilinish imkaniyitige sel qaraldi. Netijide yüz yilgha yetmigen waqit ichide lopnur dialéktida sözleydighan tüzük adem qalmidi. Yerlik alahidiliki küchlük bolghan xoten dialéktining dairisimu barghanséri tariyip barmaqta. Üchinchidin, yéqinqi yüz yilliq musapige qaraydighan bolsaq uyghur tilining lughet terkibining bashqa tillardin qobul qilinghan söz – Atalghular bilen ebjeshliship ketkenlikini, jümle qurulmilirining éghir derijidiki terjimige tayinish netijiside buzulghanliqini hés qilghili bolidu. 20 – Esirning bashlirida shiwét missionérliri qeshqerde basmixana qurghan bolup, uningda yéqinqi zaman uyghur tilida zor miqdardiki basma buyumlar neshr qilinghan. Chaghatay türkiy tilidin hazirqi zaman uyghur tiligha ötüsh mezgilidiki ötkünchi dewrge wekillik qilidighan bu basma buyumlarning tiligha nezer salghanda erebche we parsche bir qisim özleshtürme sözlerdin bashqa rus we xenzu tilliridin kirgen sözler intayin az bolup, sani nechche onghimu yetmeydighanliqini körüwélish mumkin. Hetta shu dewrde bir qisim yéngidin peyda bolghan pen – Téxnika atalghulirinimu uyghur tilining lughet bayliqidin paydilinip yasighan. Mesilen, «karbon töt oksid» üchün «kömür sasiqi», «oksigén» üchün «maddetul hayat», «darilétam» üchün «yitimxane», «parlamént» üchün «millet mejlisi» we wahakazalar. Wehalenki, aridin yérim esir ötüp 1958 – Yillargha kelgende rus tilidin kirgen söz – Atalghular uyghur tili lughet terkibining %15 ge yetken, «medeniyet inqilabi» dewrige kelgende xitay tilidin kirgen söz – Atalghular téz sürette köpeygen bolup, uyghur tili lughet terkibining %8 – %7 Ge yetken. 1999 – Yili neshr qilinghan «hazirqi zaman uyghur tilining izahliq lughiti» (qisqartilmisi) ge kirgüzülgen omumiy sözlerning kélish menbesini istilistika qilghanda, erebchidin kirgen sözler %33 ni, rus tilidin kirgen sözler %31 ni, pars tilidin kirgen sözler %21 ni, xitay tilidin kirgen sözler %4 ni teshkil qilghan. Bu hal hazirqi zaman uyghur edebiy tilining sözlük jehettin qanchilik derijide ebjeshleshkenlikini körsetmekte. Tötinchidin, yéqinqi yüz yil mabeynide ereb élipbesi asasidiki uyghur yéziqi birqanche qétimlar islah qilindi. Peqet 1984 – Yiligha kelgendila «ö» we «ü» tawushliri üchün mexsus herp yaritildi. Sabiq sowétlar ittipaqidiki uyghurlar 1930 – Yillarda latin yéziqigha 1940 – Yillardin kéyin kiril yéziqigha köchüshke mejburlandi. Weten ichidiki uyghurlargha bolsa 1960 – We 1970 – Yillarda xitayche pinyin asasidiki latin yéziqi mejburiy téngildi. 1980 – Yillarning axirigha kelgende yene qaytidin ereb élipbesi asasidiki kona yéziqigha köchürüldi. Her qétimliq yéziq almashturush bir ewlad kishilerning sawatsiz bolup qélishini keltürüp chiqardi. Buning bilen uyghur tilini qéliplashturush we takamullashturush ishi qiyinliship bardi. Uning üstige uyghur tilining imla qaidisi her dewrde bir qétimdin özgertilip peqetla tikishi toxtimidi. Yéqinqi qisqighiche 30 yil ichide uyghur tilining imlasi 5 qétim qayta özgertildi. Mana mushundaq köp qétimliq yéziq almashturush we imla özgertish netijiside dunyada xéli chong tillar qatarigha kiridighan uyghur tilining qaide – Prinsipliri téxiche qéliplashmay kelmekte. Beshinchidin, yéqinqi yüz yil mabeynide xitay bilen sowét ittipaqining türlük siyasiy oyunliri hemde orta asiya rayonini kontrol qilishtiki istratégiyiliri tüpeylidin uyghur tilining bashqa qérindash türkiy tilliri bilen bolghan ariliqi barghanséri yiraqlap ketti. Sabiq sowétlar ittipaqi hökümitining 1920 – Yillardin bashlanghan «sotsiyalistik sowét milletliri» yaritish hemde yéngi sharaitta herqaysi milletlerning musteqil edebiy tilini berpa qilish pilani küch körsitip, pütkül orta asiyada esirler boyi ortaq edebiy til rolini oynap kelgen chaghatay türkiy tili atalmish hazirqi zaman tillirigha parchilinip ketti. Buning netijiside chaghatay türkchisini ortaq edebiy yéziq til süpitide ishlitip kelgen özbékler we bashqa qérindash xelqler öz aldigha musteqil milliy tillirini yaritishqa kirishti. Uyghur tilimu mana mushundaq sharaitta chaghatay edebiy tilidin kéliwatqan qoyuq eneniliridin asta – Asta qol üzüp öz aldigha tereqqiy qilish yolini tutti. Uning üstige chégrining ikki teripidiki türkiy xelqlerning oxshashmighan yéziqlarni ishlitishi, dölet ayrimisi boyiche rus we xitay tillirining oxshashmighan derijidiki tesirige uchrishi hemde 1960 – Yillardin kéyin chégrining bir mezgil taqilishi bilen medeniy alaqilirining üzülüp qélishi seweblik ikki arida süniy peyda bolghan hang barghanséri chonglap bardi. Netijide uyghur tili bilen orta asiyadiki türkiy tilliri eslidiki chaghatay türkiy edebiy tilidin yiraqlishish bilen bir waqitta yene bir – Biri bilenmu yiraqliship ketti. Téximu échinarliq yéri shuki, süniy rewishte berpa qilinghan milliy edebiy tillar öz nöwitide yene xelqning janliq éghiz tilidinmu yiraqliship ketti. Qisqisi, uyghur we bashqa türkiy tillirining yéqinqi bir esirlik egri – Toqay kechürmishi ularning boran – Chapqunlargha tolghan milliy kechürmishlirining bir qismi bolup qaldi. Besh esir burunqi büyük mutepekkur elishir newayining tilini bügünki warisliri bir esirge yetmigen waqit ichidila terjime arqiliq chüshinidighan haletke chüshüp qaldi. Öz dewride chaghatay türkiy tilidin ibaret birla ortaq edebiy til zenjirige baghlanghan türkiy xelqliri bügün türlük namlardiki hazirqi zaman milliy tillirigha parchilinip ketti hemde öz – Ara terjime arqiliq chüshinishidighan boldi. 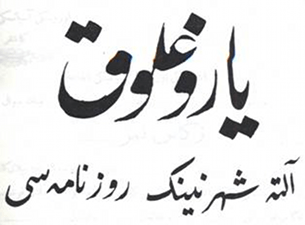 2012 – Yilliq frankfurt xelqara kitab yermenkisi 10 – Ayning 10 – Küni bashlandi. Sherqiy türkistan kultur merkizi xadimliri yermenkide uyghurche kitablar körgezmisi achti we uyghurlar mesilisini tonutushqa térishti. Sherqiy türkistan kultur merkizi ezaliri frankfurt xelqaraliq kitap körgezmiside. 2012 – Yili 12 – Öktebir. Gérmaniye, frankfurt. Gérmaniyining frankfurt shehiride yilda bir qétim ötküzülidighan xelqara kitab yermenkisige her yili izchil qatniship kéliwatqan bash shtabi frankfort shehiridiki sherqiy türkistan kultur merkizining reisi Küresh Atahan ependining bergen melumatlirigha asaslanghanda, bu yilqi körgezmige qoyulghan uyghurche kitablar xélila qiziqish qozghighan. Kitab yermenkisige dunyaning her yéridin kelgen kishiler uyghurlarning nöwettiki weziyiti toghrisida melumat sorighan we uchur igiligen. Biz bu qétimqi paaliyet toghrisida tepsiliy melumat igilesh üchün, frankfurt xelqara kitab yermenkiside uyghurlarning medeniyitini tonutush, awazini dunyagha anglitishqa ejir serp qiliwatqan sherqiy türkistan kultur merkizining reisi Küresh Atahan ependi bilen söhbet élip barduq. Diqqitinglar bu söhbet xatiriside bolghay. Sherqitürkistan Kultur Merkizi mushu ayning 11- we 12-künliri Gérmaniyede ötküziliwatqan 2012-yilliq xelqara Kitap Yermenkisige qatniship wetinimiz Sherqitürkistanning bügünki weziyitini anglatti. Sherqitürkistan Kultur Merkizi 2007-yili Frankfurtta qurulghan bolup, hazirghiche bolghan 5 yildin béri izchil türde Gérmaniyening Frankfurt sheheride her yili ötküzilip kéliwatqan bu paaliyetke qatniship, wetinimiz Sherqitürkistanning jughrapiyisi, tarixi, medeniyiti, örpi-adetliri we itnik alahidilikliri qatarliqlarni anglitip kelmekte. Sherqitürkistan Kultur Merkizi bu yilqi paaliyetke weten ichi we siritida neshir qilinghan Uyghurche, Türkche, Éngilizche, Girmanche 100 xilgha yéqin kitap hazirlighan bolup, kitaplarda millitimizning tarixiy sergüzeshtiliri, siyasiy teqdiri, medeniyet tereqqiyati, kultural alahidiliki, edebiyat-seniti, folklori, qol-hünerwenchilik we binakarliq uslubi, diniy itiqadi hem weten ichi we siritidiki siyasiy küreshliri ekis ettürülgen bolup, ziyaret qilghuchilarning alahide diqqitini tartti. Sherqitürkistan Kultur Merkizi bu paaliyetke atap axbarat élan qilip, Xitay tajawuzchillirining 60 yildin béri wetinimizde yürgüzüp kéliwatqan érqiy we kultural qirghinchiliqini bolupmu 2009-yildin kéyinki dölet térori astida yenchiliwatqan xelqimizning béshigha kéliwatqan atalmish pilanliq tughut apiti, ishsizliq, milliy maaripimizning weyran qilinishi, sünniy köchmen kelküni peyda qilip yer üsti we yer asti bayliqlirimizning talan-taraj qilinishi qatarliqlarning heqiqiy epti-beshirisini pash qildi. Sherqitürkistan Kultur Merkizi bu paaliyette yene millitimizning béshigha kéliwatqan éghir tragidiyelerni ekis ettürish üchün éngilizche, Gérmanche, Türkche hazirlanghan 1000 parchidin artuq Berishurini dunyaning 180 din artuq dölet we rayonidin kélip kitap yermenkisige qatnishiwatqan dangliq yazghuchilar, dölet erbapliri, siyasiyonlar, Jornalistlar we neshriytchilargha tarqitip, milliy herkitimiz üchün xelqarada jamaet pikiri hazirlash üchün tirishchanliq körsetti. A Uyghur man drives his motorcycle into a border guard base. A Uyghur man has killed an undetermined number of people after driving his motorcycle into the wall of a border guard base in China’s restive northwestern Uyghuristan in a suicide attack on Chinese National Day, police and residents in the area told RFA this week. The motorcycle crash caused an explosion at the People’s Armed Police facility in a rural area of Kargilik (in Chinese, Yecheng) county in Kashgar prefecture on Oct. 1, sources said, though the exact number of casualties was unknown. The police station chief at nearby Besheliq village, Abdurahman Abdusattar, confirmed an attack had occurred shortly before 12:00 p.m. at a border guard base located between Wahpi and Chasamechit villages in Kokuruk hamlet. “We were told that some people died and some were injured. But because it happened on the base, we were not given the details,” he told RFA’s Uyghur service. One resident in Chasamechit village speaking on condition of anonymity said a total of 20 people had died or been injured in the incident, but police have not confirmed the figure. Domestic media have silenced news of the incident because the political sensitivity of an attack occurring on the national holiday—the anniversary of the founding of the People’s Republic of China in 1949—could heighten tensions in a region where ethnic Uyghurs chafe under Chinese rule, a local official in another nearby village said. Before the attack, a group of two or three young Uyghur men on motorcycles had ridden into Kargilik from neighboring Guma (Pishan) county and driven around the base, surveying the location, a local resident said, speaking to RFA on condition of anonymity. Around 11:00 a.m., the group stopped in Besheliq, about 10 kilometers (6 miles) from the base, where one or two of them stayed while the remaining rider drove on alone to attack the base, the source said. The man is believed to have died in the explosion. Police have arrest warrants and are searching for two Uyghur men around age 21 or 22, Abdurahman Abdusattar said. “From what we can see from their pictures they are modern-looking Uyghur boys with unshaved heads and without beards,” he said. He said local authorities had tightened security, setting up checkpoints around the county and putting police stations on alert. “We have set up checkpoints at every entry point to the county and are checking every person and vehicle coming and leaving Kargilik,” he said on Thursday. “Right now even the village cadres are working at the checkpoints. We were told from the top to protect local police stations with extra vigilance in case of an attack,” he said. He added that county officials were holding a meeting to discuss the incident and could release information later. “Maybe soon we will receive more information about it,” he said. A local official in a nearby village, speaking on condition of anonymity, said news of the incident had been kept out of the media in order to quell fears among the Han Chinese living in Kargilik, where 20 people were killed in a stabbing incident in February. Last week’s attack could have been a reaction to the shooting in December of a group of Uyghurs in Guma county last December, the official said. The group of seven Uyghurs, including women and children, had been traveling to the Pakistani border in an attempt to flee the country, but were killed in a confrontation authorities described as a “terrorist” attack. Chinese authorities often link Uyghurs in Xinjiang to violent separatist groups but experts familiar with the region have said China has exaggerated the threat and cited a “war on terror” in attempt to redirect criticism of domestic policies that cause unrest. Uyghurs say they are subjected to political control and persecution for opposing Chinese rule in Xinjiang, which has been gripped by persistent ethnic tensions between Muslim Uyghurs and the rapidly growing Han Chinese population.